Who has DST in 2020? 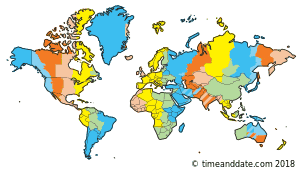 This list displays a brief (but not complete) overview showing the countries and territories which plan to observe DST during 2020. Note that this list might not be final - countries, territories, and states sometimes make adjustments which are announced just days or weeks ahead of the time change. Detailed information is available for the first half of 2020 and for the second half of 2020. * Some locations have multiple periods of DST: the start of the first period and end of the last period are listed.